I had no idea when we visited Shaker Village at Pleasant Hill earlier this month that there would also be a small quilt exhibit in addition to the special Shaker textile exhibit. These quilts were made in the 1970's through the 1990's. 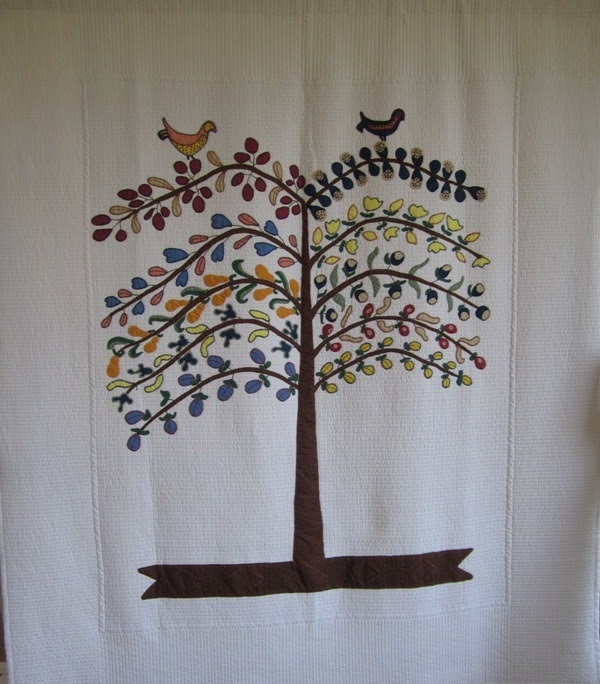 The famous Tree of Life, so ofte seen on Shaker items, appears on some of the quilts. 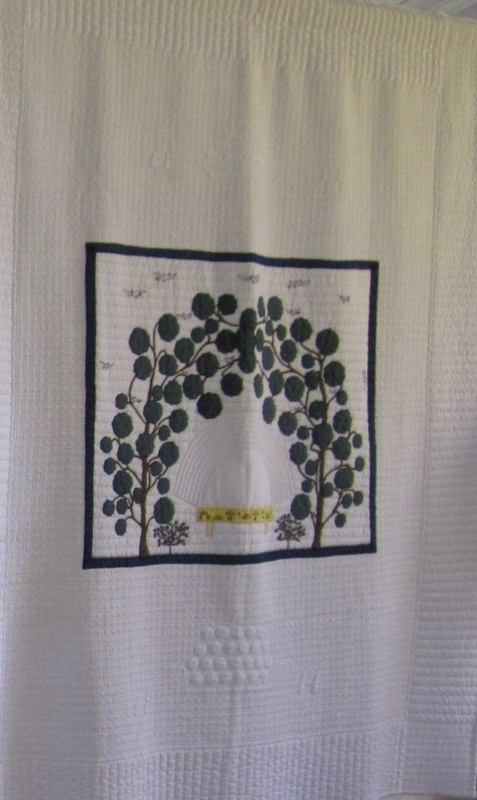 According to one of the quilt exhibit signs, the Tree of Life is mentioned in the Book of Revelation: It bore twelve manner of fruit, and yielded her fruit each month. And the leaves of the Tree is for healing of the Nations of the Earth. Here is another of the lovely quilts. 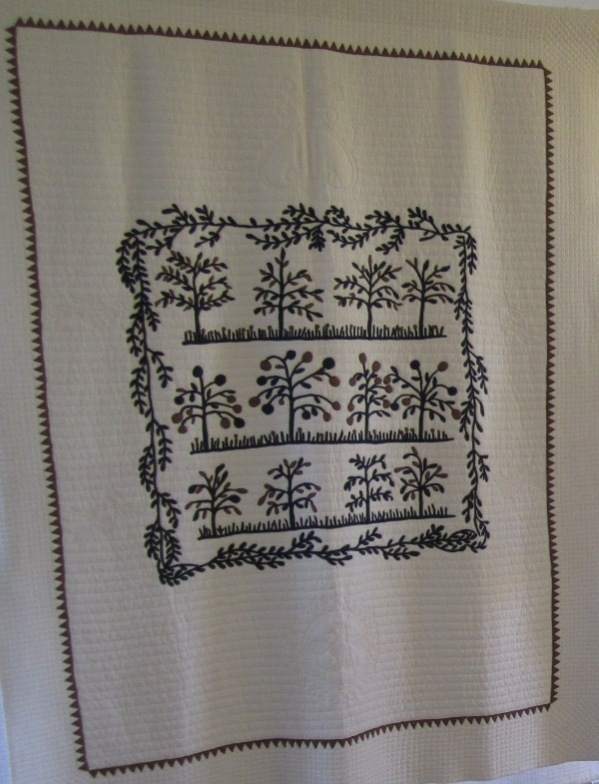 This quilt depicts a Tree of Herbs. Isn't the quilt wonderful? Next we went to the Golden Threads textile exhibit. The current exhibit is the first one in over a decade. Some of the textiles and textile tools have rarely been seen. Here is a sampler and some needlework tools. Next is a display of kerchiefs, scarves. and berthas. The early Shaker women wore cotton or linen kerchiefs or scarves across their shoulders. Later, checked scarves became popular. By the early 1820's, the Shakers at Pleasant Hill were producing their own silk, so brightly colored silk scarves became popular among the sisters. Later in the 19th century, berthas replaced scarves and handkerchiefs in popularity. The bertha looked like a small cape or stole and was often made out of the same fabric as the dress. Many berthas were decorated with ribbon, braid, or buttons. The photo below shows Catherine Allen's dress, bonnet, and scarf. Catherine's clothing was typical of that worn by many Shaker women in the late 19th to early 20th early century. The dress, which is form fitting, has no buttons so it was closed with pins. The quilted silk bonnet was designed to be worn outside in cold weather. The long, pink scarf was likely made at Pleasant Hill. Here are some more bonnets and a bonnet form. The Pleasant Hill sisters made hundreds of sheets, blankets, and coverlets. Here are some more photos from the textile exhibit. Most of the items are marked with initials. Most Shaker rugs were woven, braided, hooked, knitted, or crocheted into geometric or abstract designs. The rugs, besides being functional, were also a great way to use scraps of fabric that had no other use. This horse rug is not typical of Shaker rugs because few rugs used images; most had geometric patterns. These items, while not old, are reproductions of sewing items used by the Shaker women. It has been so nice hearing from so many of you about how you enjoyed seeing photos from our short visit to Pleasant Hill. Just writing the last three blog posts about our visit there already has me very anxious to return. Great photos! I have really enjoyed looking and reading about your visit. I would love to go there some day. Thank you for the wonderful and interesting photos. Pleasant Hill is a fascinating place to visit. The quilts were beautiful! Thank you for your story and photos from the show. Very interesting and informative . How lucky was that Ellen!! your pictures are wonderful, thank you so much. What a great exhibit you got to see! Love seeing everything -- thanks for sharing it with us. Have a wonderful Thanksgiving! Ellen, Thank you so much for the beautiful and informative posts about Shaker Village. Reading the posts and looking at all the great photos almost made it seem as if I'd been there myself.